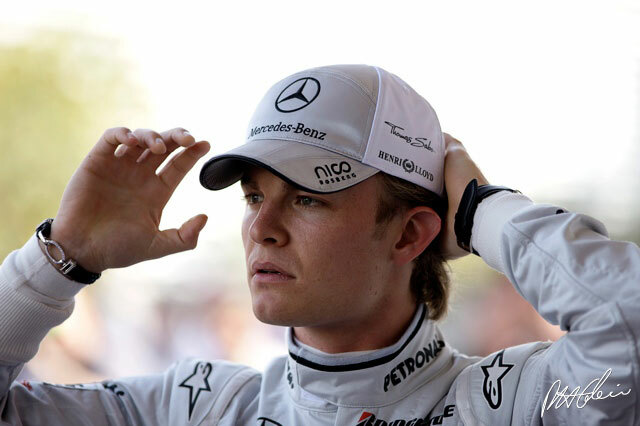 Nico Rosberg grew up with motor racing, the son of 1982 World Champion Keke Rosberg. He grew up visiting DTM races, in which his father raced in the 1990s. At the age of 10 Rosberg tried out a kart for the first time at a track in the south of France and in 1996 he began competing in the regional mini-kart series. He won the French title in 1997 and soon became a successful kart racer at international level. In 2002 he switched to cars, competing in the Formula BMW series, winning nine races and the title. At the end of his first season in cars he tested for the Williams-BMW team, becoming the youngest ever F1 driver. He then moved up to Formula 3 with his father's Team Rosberg and won a race at Le Mans. He ended the year as the second best rookie of the year (behind Christian Klien). At the end of the year Williams gave him another test but he stayed in European F3 in 2004, winning three races and finishing fourth overall. Moving up to GP2 in 2005, he joined the ART Grand Prix operation and quickly found his feet and was soon winning races. He was hired to be the second test driver at Williams and at the end of the year was confirmed as Mark Webber's team mate at Williams in 2006. The year started well but as the races progressed Rosberg had too many accidents but he was retained in 2007 alongside Alexander Wurz. The team had new Toyota engines and the FW29 seemed to have good pace and Rosberg finished in the points seven times, including fourth in Brazil. He outshone Wurz and became Williams team leader in 2008 when Kazuki Nakajima joined the team. Nico scored his first podium finish with third in Australia but had a disappointing season after that, although he lucked in to second place in Singapore when a Safety Car intervention gave him a huge advantage and he was even able to overcome a 10-second stop-go penalty. On several occasions he was beaten by Nakajima, but Williams retained him for 2009, hoping that he would have a better year. And Rosberg did indeed have a better season in 2009. He was more consistent, and he scored points in 10 of 17 races. The Williams FW31 was one of three cars, along with Brawn and Toyota, to start the season with the double-deck rear diffuser, and that gave those teams an advantage in the early races. But the Williams team was unable to sustain its development pace throughout the season. Rosberg's best finish was third in the opening round in Australia, but he also finished fourth twice and fifth four times. Plus he finished every race except for Brazil where he had a gearbox failure. He ended up seventh in the championship. Rosberg scored all 34.5 of the team's points while Kazuki Nakajima contributed none. After four years, however, the Williams/Rosberg partnership had reached its conclusion. Rosberg, who had an offer to join Mercedes/Brawn in 2010, had already decided to leave when the Williams team told him there was no place for him in 2010. After the way the Brawn team dominated in 2009, Rosberg admitted he was disappointed that the team did not produce a better car in 2010. The team was concentrating so much on the 2009 title and the transfer of ownership to Mercedes that the design of its 2010 car suffered. But Rosberg certainly took satisfaction in the fact that he scored 142 points while his famous teammate Michael Schumacher only earned 72 while making a comeback after three years away from F1. This was the first time ever that a teammate of Schumacher had racked up more points in a season where Schumacher competed in all the races. Rosberg definitely coped better with the car's terminal understeer than Schumacher did. Rosberg had three podium finishes in 2010. He took points in all but four of the races, and he generally finished higher than where he qualified. He finished seventh in the championship, which was the highest for a driver not from Red Bull, Ferrari or McLaren. This was a season where Rosberg convinced many doubters who had questioned his speed and consistency.